Unlearning something can be very difficult. 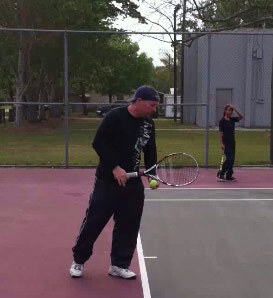 Changing a stroke in tennis to the point where it can be done correctly in a high stress situation (like a match) can take a very long time to do. Fortunately improvement, while slow, is usually fairly immediate. For anyone trying to learn something it is important for them to see some progress. For players trying to change a stroke, where initially the overall stroke will be much worse when trying to change, progressions show that progress is in fact being made. By following a set of defined progressions these improvements can be shown as there are little subtle changes that will eventually improve the overall stroke. For beginner players, just learning the game, it lets them attain a level of success right away without having to worry about hitting the ball in the court. Progressions give a player a place to start. Progressions build a strong player by building a strong foundation. When done correctly, progressions can take a player with little to no ability or knowledge of the stroke and give them a high level of ability and knowledge. By starting with the most basic elements and adding on from there this can be achieved. Progressions show a player more subtle improvements and thus can show them a certain level of success almost immediately. Players are almost immediately able to do the first progression correctly. As the progressions get more difficult the player will initially struggle to do the newest progression correctly, but hopefully they will still do all the previous progressions correctly. After mastering the first progression, players will eventually master the second and subsequent progressions until eventually all the progressions are mastered and the player has taken the stroke to an advanced level. Progressions also allow the player to break down a complex maneuver into smaller segments which are much easier for their brain and body to wrap themselves around and hopefully understand better. Think back to the dance analogy from earlier. 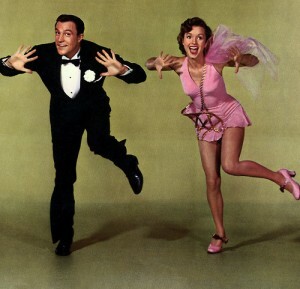 Below are two examples of how a dance could be taught. A dance instructor shows a student a 30 second dance with numerous steps. 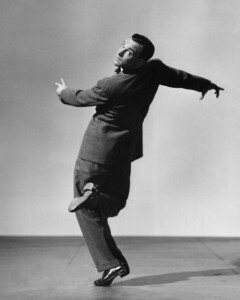 The dance is done to music and at full speed. After the dance is done the instructor takes the student through the whole routine one step at a time making sure they can do the first step correctly before adding on the next step. Next, they make sure the student can do the whole dance correctly and slowly before speeding it up. If any mistake is made, the instructor stops the dance and has the student start over making sure it is done right. Which example is more likely to produce a student who does the dance correctly? 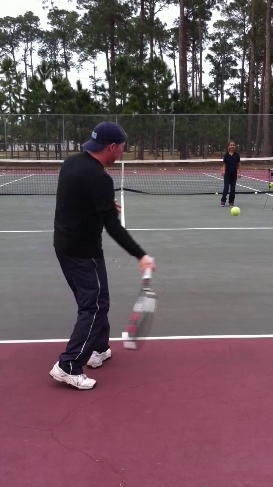 Obviously example 2, (which is exactly how my daughters dance instructor taught them), but many people teaching tennis follow the first example. A student who follows example one may be able to do a dance that reasonably mimics the instructors dance (in that its a dance) and maybe they can learn to dance quicker then in example 2, but it will most definitely NOT be the same dance and their level of “dancing” will probably be pretty low. In example 2, with enough practice, the student should be able to do the dance almost identically to the instructor. It will just take quite a bit longer to do it the right way. Progressions are also great because by segmenting and slowing down the strokes a player can more easily self evaluate themselves for mistakes. Generally, even done at a slow pace, the player will still make the same mistakes that they make at full speed. It is always amazing to me how even if I guide someone slowly through a swing how often they will still make mistakes. Mistakes are much easier to notice if done at a slow pace by both the instructor and the student. 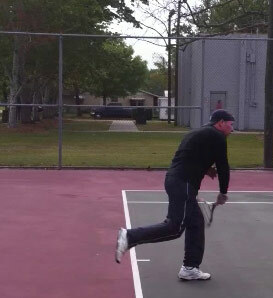 There are two levels of progressions incorporated into learning a tennis stroke. The first one is breaking the overall stroke down into smaller segments. This allows for a player to master the first part before moving onto the next segment. As each subsequent segment is mastered a new one can be added on until eventually the whole stroke is able to be done correctly. 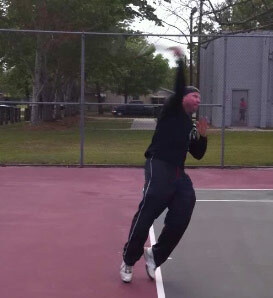 The second level of progression revolves around the complexity of the overall shot and are called stroke progressions. The easiest progression is a shadow swing, a swing without a ball, and progresses all the way up to playing a match. As with the segmented progressions a player must be able to do the first progression (shadow swing) correctly before moving on to the next progression. The tennis serve has 7 segments. 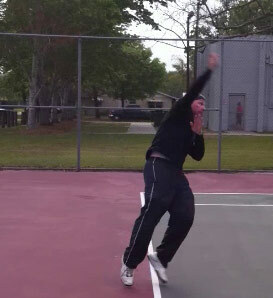 The forehand volley and backhand volley have 5 segments each. Other strokes have a varying number of segments. The key to good stroke progressions is to be patient, go slow and make sure each segment is done correctly. After one segment is consistently done right, the next progression can be added to the previous progression. Eventually each segment is added until the whole stroke is able to be done. The last segmented progression is the first stroke progression. After the overall stroke has been mastered through segmented progressions the player can move onto stroke progressions.After stroke progressions have been mastered the player will be able to use the stroke in a competitive match. 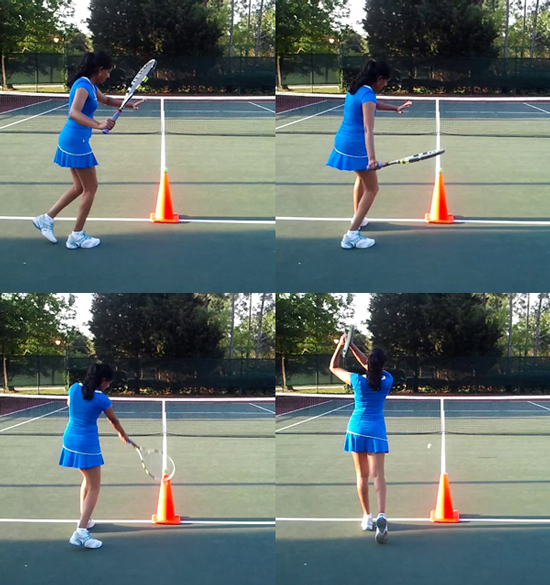 There are also several pre-stroke progressions that can be used before even picking up the racquet. 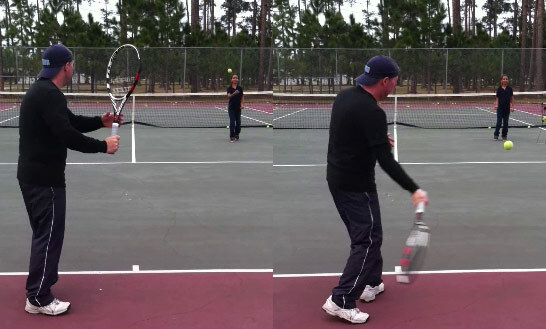 These involve doing the complete stroke without segmenting the swing, they just don’t use a racquet. 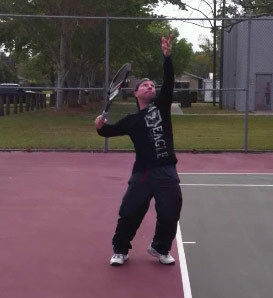 This type of progression helps to focus on maintaining balance and to help a player to realize that a tennis swing is not just an arm swing, but a full body swing. A hand swing also helps to focus on the body while putting the arm into the correct position during the swing. A shadow swing is basically a swing without the ball. Shadow swings can be done slowly at first and then the speed can be increased. By not using a ball the player can go really slow and make sure the swing is being done 100 % correctly. 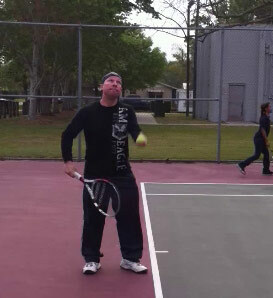 By placing a tennis ball on a cone or tee the player can still go really slow since the ball will not move, but it allows the player to start feeling a ball on the racquet. Drop hitting adds a dimension to the swing as the ball will be moving. The ball should only be moving two dimensionally vertically and horizontally. This adds the third dimension into hitting the ball as now the ball will also be moving towards the player. By the ball being tossed it will be moving relatively slowly which is easier to hit. The ball is also easier to toss into a position so the hitter does not have to make too many adjustments to the racquet, feet or body to hit the ball. From the service line the ball will need to be hit slightly harder in order to get to the hitter. Because there is a greater distance between the feeder and hitter there will be more inconsistent hits by the feeder. This will cause the hitter to have to make more adjustments then even feeds from the net. Balls will also tend to bounce slightly higher as the feeder will need to increase the trajectory to get the ball to the hitter. Feeds from the baseline offer the closest simulation to rallying without really rallying. This allows players to hit one ball and they can then recover at their own pace. The next ball can be hit to them when they are ready. Real rallies make it hard for a person training to hit at their own pace. Non-competitive hitting allows players to get into a rhythm and flow, like in a real rally, but by being non-competitive it hopefully means the ball will be hit slower and to the person. Non-competitive is all about trying to keep the ball in play. By not having players serve the rallies should go a little longer, by making it competitive the players will be forced to hit the ball in all situations. Everyone makes mistakes. This is a very important statement to remember. Even the pro’s make mistakes. Its what happens after the mistake that helps determine whether their is an improvement. Its one reason why you will many times see the professionals shadow swing after they know they’ve made a mistake. They are trying to rectify a mistake. If a person does not try to change a mistake (or maybe even doesn’t know they’ve made a mistake), there is no chance of improving. That is one of the benefits of having a qualified person look at your tennis strokes as they can usually point out where the mistake is being made. If you do not have that luxury there are still ways that you can check yourself for mistakes. Once you know the mistake, then it can be corrected. Once a mistake is made it is best to stop and start over. There is no reason to continue. 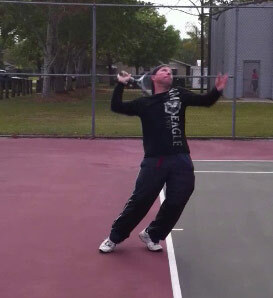 Mistakes can be very hard to see or feel in tennis, the swing at full speed happens so fast that it is almost impossible to see what is really happening. One of the hardest things for someone to do is to self evaluate themselves while swinging. It can be done to a point, but is virtually impossible to do for smaller elements. That is why I am a big proponent video analysis. Luckily getting a video of a players strokes is easy. There are a lot of available programs and apps at a very inexpensive price or for free. Plus, most people have high definition video cameras on their smartphones. Video analysis is the perfect tool to help improve a stroke. By using video a player can see themselves in slow motion and can very easily find mistakes in their swing if they know what they are looking for. I strongly recommend that everyone check out the video analysis section for a complete how to guide. This section can be found here. Practice is basically recognizing errors and fixing these errors. All the above information is covered thoroughly in the excellent book, The Talent Code, written by Daniel Coyle. I would recommend everyone read this book. Check out his website here for more information. Every practice session laid out on this site follows the above principles.